The Malaysian Prime Minister, Najib Razak, said today that there was now a high degree of certainty that someone on board missing flight MH370 deliberately disabled the aircraft’s data transmission system and switched off the transponder. The Aircraft Communications Addressing and Reporting System (ACARS) sends information about the plane’s engine health, for instance, and the transponder transmits such details as altitude, speed and location. Najib has finally confirmed that the missing plane did turn around after take-off and fly on well after its apparent disappearance. He said the plane’s movements were “consistent with deliberate action by someone on the plane”. The authorities are now investigating two possible routes for the aircraft: one in a northern corridor stretching roughly from the border of Kazakhstan and Turkmenistan to northern Thailand and the other in a southern corridor stretching from Indonesia to the southern Indian Ocean. The last confirmed communication between the plane and a satellite was at 8.11 a.m. last Saturday, six hours after it was last detected by military radar. Najib said the ACARS was disabled just before the aircraft reached the east coast of peninsular Malaysia. Shortly afterwards, near the border between Malaysia and Vietnamese air traffic control, the aircraft’s transponder was switched off. The plane then turned around and flew west back over peninsular Malaysia before turning northwest. Military radio lost track of the plane at 2.15 a.m. and civilian radar lost it at 1.30 a.m.
Najib said the Malaysian authorities had now refocused their investigation on the crew and passengers on board flight MH370. Police are reported to have conducted a two-hour search in the home of the captain who was piloting the flight, 53-year-old Zaharie Ahmad Shah. Najib insisted the authorities were not concentrating solely on the theory of hijacking. The police had already talked earlier in the week about the possibility of a hijacking or sabotage and the question of whether any of the passengers or crew had psychological or personal problems. Malaysia is no longer searching in the South China sea, but there is now a huge area of land and ocean to be covered to the west. Fourteen countries, 43 ships, and 58 aircraft are now involved in the search. It seems like pieces of an awful jigsaw are coming together, but huge questions remain, not least how the aircraft could have travelled so far being detected only by satellite pings. There is a whole new raft of speculation about where the plane went and how it remained hidden from radar. Today’s news will be no real comfort to the families of those on board but there has to be a certain relief that after all the endless speculation and conflicting reports of the past week, more specific information is finally being provided. Najib said this was an excruciating time for the families of those on board the missing plane. No words, he said, could describe the pain they must be going through. 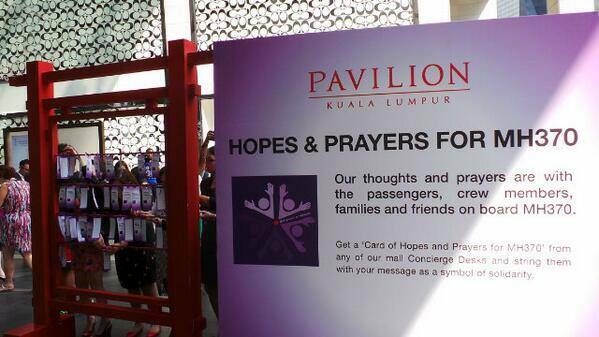 The thoughts and prayers of Malaysians were with them, he said. This was the first time the prime minister made an official statement on the disappearance of the Malaysia Airlines plane with 239 people on board. There has been criticism that the Malaysian authorities have released information too slowly. 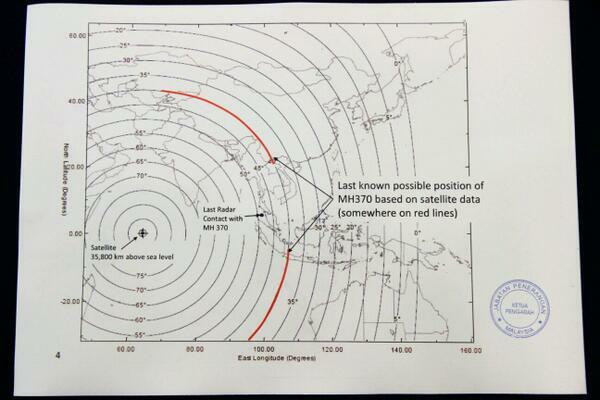 Malaysia Airlines said today that it had been critical to verify and analyse raw satellite data before releasing it.